Home Security and Conflict	Fiji – Fun in the Sun with Guns! In the rough and tumble world of International Relations, it is sometimes easy to focus too much on the major players, and allow the smaller (but no less interesting) states to disappear from view. With that in mind, and with the caveat that a brief article can only hope to scratch the surface of even the smallest of players on the world stage, this exploration of the current situation in Fiji is intended to view the IR arena through the lens of a small island nation. From the absurdity of Westphalian notions of sovereign functional equality, to the demonstrations of Rosenau’s “Fragmegration” in action, the tiny, beautiful state of Fiji allows students of IR to view the swirling complexity of modern globalization in a microcosm. To set the scene, Fiji has been an independent state since 1970, and in its short forty year history has suffered through four military coups. The last one took place in 2006, and while Commodore Josaia Voreqe “Frank” Bainimarama (the reigning Prime Minister), swears that nation-wide elections will take place in 2014, the fact that he is the same man who overthrew the last regime suggests to most outside observers that they should not hold their breath. The revelation that Fiji is now regarded as a “Parliamentary Republic”, run by a “Military Appointed Government” also suggests that even military dictatorships have a sense of humor, in addition to a good PR department. So good, in fact, that the G-77 (+ China) recently announced that Fiji would take over as chairman of the UN’s largest geo-political voting block in 2013. As the “voice of the developing world”, the G-77 represents the vast majority of the “Global South”, encompassing 132 players in the great game of international relations. This is Westphalianism at its most interesting, given that Fiji (an island nation with a population of just over 850,000) will be the point-person for developmental agendas in a group that encompasses states such as Brazil, India and China. It takes a great sense of faith in the precepts of sovereign equality to see how this is supposed to work. Either that, or a healthy dose of skepticism about the realities of power relationships in our anarchic system. What is truly fascinating about Fiji is the nature of its domestic troubles, and the way in which they represent the turmoil that has become such a topic of academic debate in globalization theory. The population of Fiji has been split along both racial and economic lines, with institutionalized racism as an explicit aspect of the national political discourse. Within the Fijian constitution (currently abrogated) 37 of the 70 Parliamentary seats were reserved for “native Fijians”, meaning that a nativist political infrastructure was mandated as a majority. This issue of racial politics is just one of the things that the current regime promises to reform in the new constitution, due by 2013 but still the subject of some debate. However, the vast majority of the Island’s commercial wealth is generated within the Indo-Fijian population – a diaspora that was brought to Fiji during the British colonial era to work the sugar plantations, and has since shown the same entrepreneurial spirit that has marked their presence in so many other Commonwealth countries. Unfortunately, this has also led to many of the same discriminatory tactics faced by Indian diasporas elsewhere. In fact, there was a substantial, violent backlash against Indo-Fijians after the third coup d’état in 2000, exacerbating an already troubling trend towards an exodus from paradise for the Indian community. If the situation were not complex enough, Fiji recently made international headlines when the winner of the Ms. World – Fiji contest (2012) provoked outrage over the fact that she did not look “native” enough. Ms. Torika Watters, of mixed Fijian and European heritage, was subsequently disqualified for being too young to enter the competition, thereby neatly side-stepping the inherent racism involved, and avoiding the need to address this political hot-potato on a global (if somewhat superficial) stage. However, while the incident may have been swept under the carpet, the notions of ethnic identification that were behind the outrage have not been displaced so easily. These issues concerning nationality, ethnicity, and fundamental notions of identity in the modern state are indicative of what James Rosenau describes as “Fragmegration.” While the processes of globalization continue to draw this tiny state into the global flows of commerce, governance, and communication, they are also serving to pull the fabric of society apart. The changing nature of Fijian demographics, fluctuating as they do with the flow of new ethnicities into and out of the country (including many new immigrants from the Philippines) mean that the “imagined community” of the state is under ever increasing pressure. The response of the military to retreat into authoritarianism in order to shore up the walls of nationalism can only be a stop-gap measure at best. 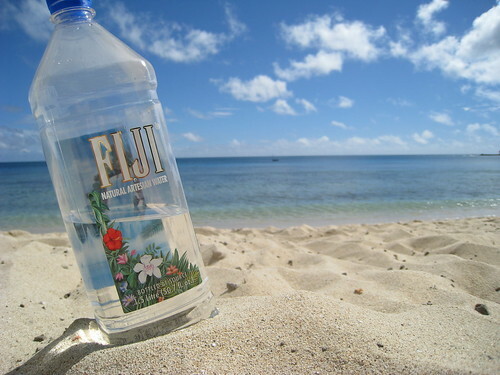 While trendy hipsters and society dilettantes sip their Fiji Water in bars on Rodeo Drive (shipped across the vast expanse of the Pacific Ocean, in bottles manufactured from Chinese plastic) they are partially funding a military dictatorship hidden behind the image of a tropical paradise. What is astounding is the fact that, even in this day and age, the image of Fiji as an Island paradise is so pervasive that folks happily go there on their dream honeymoons, without ever actually coming into contact with the political reality of visiting a dictatorship. This is not to suggest that people should stop going, simply that they should be aware of where they are going, and what is happening there. Given that tourism is the lion’s share of the national economy, this is a significant potential lever for change. While the situation is still tense, and the prospect of reform is rather aspirational at present, it is both heartening and disappointing to see the reaction of the world at large. On the positive side, the Commonwealth of Nations, the Pacific Islands Forum, and the Pacific Agreement on Closer Economic Relations have all suspended Fiji from membership. However, while the UN Security Council has called for “fair elections” to be held as soon as possible, it has still not seen fit to recall the 1000 Fijian Peacekeepers that are stationed around the world, representing the international community in their famous blue helmets. And then, of course, there is the chairmanship of the G-77. It seems that even in the modern era of global governance and institutionalized legalism, the Waltzian ideal lives on, no matter how crazy it might be. Apparently, the dictators of the world are free to do as they please, provided their nation is far enough away to avoid any unseemly publicity. As they say in the corridors of power, “plus ça change, plus c’est la même chose.” (“The more things change, the more they stay the same” – Jean-Baptiste Alphonse Karr). James Walker is a fourth-year Global Studies student and a research intern at the Burkle Center.